It was time to return to Onehouse. I had first explored these hilly parishes on the outskirts of Stowmarket back in the late 1990s, and my journeys since then had not brought me back here. This is not altogether surprising; although Onehouse includes part of the urban area of its neighbour - indeed, the Stow Union Workhouse, today converted into apartments, was in Onehouse parish - the village itself is over the hill from there, and you wouldn't know. The church itself, like several around here, is small and out in the fields, a quarter of a mile's walk, cycle, or bumpy drive from the nearest road. In the misty light of this early February day it looked haunting from a distance, as if from any time. It reminded me of St John the Baptist's few moments of fame back in the 1970s, when it appeared at the opening of an episode of the popular BBC TV series The Survivors, which was partly filmed on location in this part of Suffolk. The sense of timelessness extends to the small graveyard, with its scattering of mainly 19th century headstones. By the western hedge, a beautifully cut stone is inscribed with initials and the date 1846. You can't help thinking that not much has changed here since then. In fact, that wouldn't be correct. When Mortlock came this way in the 1980s, he found a tall tower with obvious Saxon features. However, by the 1990s, this tower had become unsafe, and somewhat barbarically it was reduced by two thirds in height, and then partly built up again with modern battlements. For this reason, St John the Baptist today appears to be a different church from the time of its fifteen minutes of fame. 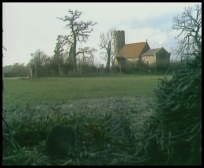 You can see a still from The Survivors on the right, showing the church with its tower intact. Apart from that, not much has changed. We know that at the time of the National Census of Religious Observance in 1851, the population of Onehouse was 432. However, 225 of these were inmates of Stow Union Workhouse, which had its own chapel. Of the remaining 207 souls, a bare 25 made it to St John the Baptist church on the morning of the census, although the minister claimed that the normal number was 35. I make that roughly one in six of the parish going to the Anglican church if you exclude the paupers, which was below the national average. In 1851, most Anglican church attendances were reaching a peak, and in Suffolk as a whole the typical attendance was nearer one in three. It may be that the parishioners of Onehouse were a particularly godless lot, but the Minister, Thomas Pyke, moaned in the return that the parish had a number of dissenters who brought their children for baptism but did not otherwise attend. Most likely, the great majority of churchgoers were going over the hill to Stowmarket, a staunchly protestant town with four large chapels averaging 800 each on a Sunday. 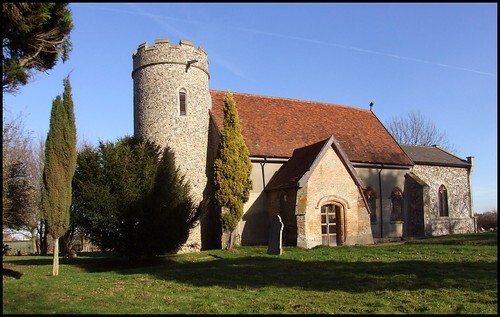 Perhaps this reticence still infects the parish today, for I have to tell you that, for me, St John the Baptist is one of the least welcoming churches anywhere in central Suffolk. I have never found it open, and neither has anyone else I know. There is no keyholder information. At one time, there was even a notice telling people who wanted to see inside that they would have to come to a service, but such militant hostility now seems to be in retreat. Instead, there's just the locked door. 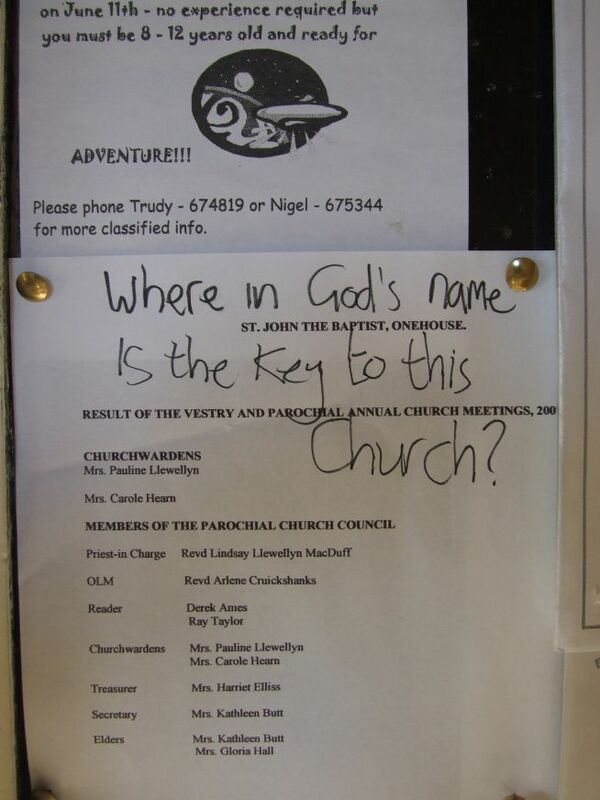 Some poor soul had left a cry for help on the noticeboard: Where in God's name is the key for this church? it read. There was, of course, no answer. Probably, there is not much to see. The entire church is heavily Victorianised, and if you were told it was the dull work of plodding Diocesan Architect Herbert Green then you would not be surprised. There are some roundels of what looks like continental glass in the west window. There is no stone guard, and so ironically, but not surprisingly, the one great treasure of the church is unprotected, despite the locked door. If it was open, of course, you could at least go in and say a prayer. Looking through other windows, I saw one possible reason for the church being inaccessible: no one had bothered to put away the electronic audio system. I expect they would complain if someone broke in and stole it, but it would be a reminder that locked doors are no protection against a determined thief, and that, in any case, the protection of property is not a Gospel value. It isn't just the locked door and the isolation in a field which makes this church little-known. Although it is particularly beautiful, it is like its near neighbour Harleston in that this is one of the churches which Cautley found dull, and about which Pevsner could think of little to say. Consequently, it receives few visitors compared with the glories of, say, nearby Woolpit. There is not much of historical or architectural significance here, so most serious churchcrawlers don't bother. But I must finish by saying that I have been inside St John the Baptist, and the memory of that occasion sticks like a burr in my mind. It was in the early summer of 1997, and we came here for the blessing of the marriage of my friends Simon and Sarah. At the time, my wife was seven months pregnant, and so she sat on a chair by the font, with a cool breeze carrying birdsong through the ancient south doorway from the rising barley beyond. It was a joyous occasion; but, in retrospect, one tinged with sadness. This was the last time I saw my friend Brian, who was to die of a heart attack on a lonely night train across America a few weeks later. In July, my daughter Martha was born, and so I suppose that I will always associate this church more than any other with the whole carnival of birth, love and death, ageless and eternal in a Suffolk field.